Cliques is excited to take the Cliques Console out of beta and officially launch v1.0. We have worked tirelessly to implement a number of user requests and build-out some unprecedented features, allowing both advertisers and publishers to maximize their campaigns and placements. Below we'll explain the newest features and updates to the console. For Advertisers We wanted to make it easier for advertisers to jump between multiple campaigns, while seeing their high-line data such as CTR, campaign spend and Ave CPM at a glance. The carousel at the bottom will display the most recent screen shots that our spider has scraped from the sites your campaign is running on. Publishers requested being able to see their RPM at first glance, so we've moved it front and center on the dashboard. The image carousel at the bottom will display the most recent screen shots with Cliques ads running on your properties. View more data in less time. Carousel view of your latest screenshots. Your ads/placements captured in real-time, more on this later. This new section has been a major project for us, and we're really excited about the data our users will be able to mine from this section. You'll be able to use our pre-built Quick Queries or you can get super specific and build your own (coming soon). Filter and group reports by dozens of different dimensions. Want to know what what time of day in New Mexico your 300x250 is generating the most activity? We can tell you that. Use this data to update and maximize the impact of your campaign by knowing where, when and which creatives are driving the highest CTRs. Transparency is a cornerstone principle at Cliques and we were determined to find a way to show Advertisers and Publishers alike what ads were running on what sites alongside what content. Enter the Cliques spider that crawls our Publisher roster capturing screenshots of your ads in the wild. These screenshots are real, as they happened images and are updated in real time. Clicking on a specific screenshot will give you detailed information about that shot. As excited as we are to release our initial platform from beta we are equally as excited to be releasing our most-requested feature, programmatic Native, into beta. 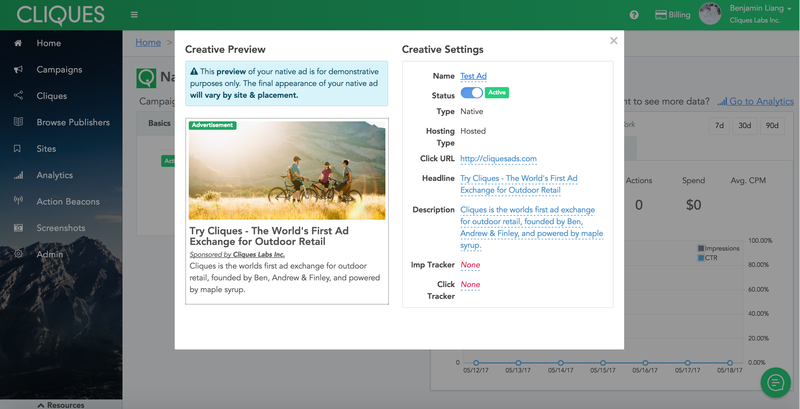 This new feature will allow Advertisers to purchase on-demand Native placements with the same control and ease that is now available for banner placements.